I'll also be explaining a brief introduction into the modes. Major, Minor, Minor, Major, Major, Minor, Diminished. Try and remember that. (England) = Tone, Tone, Semi-tone, Tone, Tone, Tone, Semi-tone. (North/South America) = Whole, Whole, Half, Whole, Whole, Whole, Half. I'm going to use Tone and Semi-tone, as I'm used to it. Incase that's too confusing, take up your guitar and play fret 8 (6th string), this is C, now move to the 9th fret and this is C#. This means that they're a semi-tone apart (1 fret). Where as, C to D will be frets 8 to 10, so it's two frets apart which is called a Tone/Whole note. If you don't understand why I put some notes in brackets, it's basically because they are the same note. The easiest way to show this is to look at a Piano. This is basically where you start to learn the modes. For the easiest way to explain that we usually use C because there are no sharps or flats in this key. As you can see from the table, I've numbered out each note, and each note can be a starting point. This is what we call modes. So to explain the modes we've given each mode a name so it's easier to remember. Naturally, each scale will have different names for each mode. Tone, Semi-tone, Tone, Tone, Semi-tone, Tone, Tone. 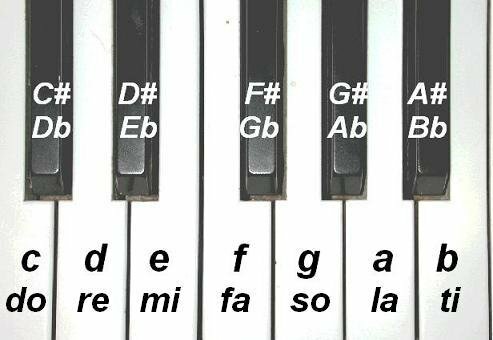 |  A   |   B    |    C    |   D    |   E   |   F    |    G    | A is the natural minor (6th position) of C major. |  Bb  |   C    |    Db   |   Eb   |   F   |   Gb   |    Ab   | Bb(A#) is the 6th of C# Major. |  B   |   C#   |    D    |   E    |   F#  |   G    |    A    | B is the 6th of D Major. |  C   |   D    |    Eb   |   F    |   G   |   Ab   |    Bb   | C is the 6th of Eb Major. |  C#  |   D#   |    E    |   F#   |   G#  |   A    |    B    | C# is the 6th of E Major. |  D   |   E    |    F    |   G    |   A   |   Bb   |    C    | D is the 6th of F Major. |  Eb  |   F    |    Gb   |   Ab   |   Bb  |   Cb   |    Db   | Eb(F#) is the 6th of A Major. |  E   |   F#   |    G    |   A    |   B   |   C    |    D    | E is the 6th of G Major. |  F   |   G    |    Ab   |   Bb   |   C   |   Db   |    Eb   | F is the 6th of Ab Major. |  F#  |   G#   |    A    |   B    |   C#  |   D    |    E    | F# is the 6th of A Major. |  G   |   A    |    Bb   |   C    |   D   |   Eb   |    F    | G is the 6th of Bb Major. |  Ab  |   Bb   |    B    |   Db   |   Eb  |   Fb   |    Gb   | Ab(G#) is the 6th of B Major. I'm in the making of a more detailed lesson on this scale. Hopefully this is clear. It's important to know the notes that you're playing ontop of what fret and string you're playing, make sure to memorise the notes so you don't get confused during an improvisation! Is natural minor the same as minor? minor is a general term. there is natural, harmonic and melodic minor scales just to name a few. saying the "natural minor" connotes the sixth mode in a major key. haha...i think youre better off just trying to learn the scales seperately. because they are really totally different from one another. you cant rush through learning theory guys. just take it one step at a time. music is a lifelong learning experience man. You should understand that the Natural Minor is the 6th position from the major scale. Once you've understood that properly, you should move on to understanding the rest of the modes. Once you've understood that, then you should start studying other scales, but not until then. I'm posting this lesson for everyone though, because some are more advanced than others, this lesson is just showing the basic keys in other scales. what does a b mean in front of a number???? b means flat. Its the semitone between each whole tone. hey, so if i am playing a D, F#, G progression, what key am I in. Ive read up on the key lessons, but i doesn't seem like mine matches up with any of them. thanks for any input. michaelcollins? what? you have all of this memorized? as in you are able to use all of it in a good manner? i mean, memorizing is one thing, but knowing how to use a totally different thing. You should also try and learn at least one chord every day. It'll benefit in the long run! Would be really nice if you could do something on it, haha. i don't mean to push you! I just want to let you know that it would be appreciated very much. I'm in the middle of writing two other lessons atm, so the Harmonic lesson will have to wait. I haven't finished the grades in theory and there are 8 grades, so I'd like to do that first. Great job, I noticed that the English use tone-semitone and the States use whole half. When I first learned the scale it was from a book that used tone semitone but when I tried to explain it no one knew what I meant. They all used whole half. After all these years now I know why very few use tone semitone. It's kinda the same with notes and quavers. I don't know anyone who uses quavers! It's only very few to you because you live in America =P Over here we only say Tone and Semitone... But I think it's best to know both. excuse me miss jazzy,but i believe you informed.me before that locrian is half dim.or us that just relative to a chord scale using 7ths? I'm not trying to confuse you - but Locrian is a half diminished - with the examples I showed you in whatever topic it was. I thought those examples would have made it clear why it was a half diminished. Dorian is a Minor, right? And so is Phrygian. The reason why they are minor is because they have a flat 3rd and flat 7. They're both minor but they have an obvious difference. So it's triad is the root, third and fifth. 1, b3, b5. And IT'S Triad is the exact same because they start the same - but they end differently. Does that make more sense? They're in the same family but still have a difference. I understand in this lesson ,you state the locrian is diminished but in that thread you say its half diminished,I know i have fought you every step of the way in this explaination of,but you are correct.when you say im confused.Im just tryn to.make for certain itis either dim.or half dim. btw heres the link to that thread. locrian is halfdim because it does not contain a b7th correct? Locrian does have a b7 dude. :) Diminished has a bb7. Please take another look at the last comment I just posted (other than this one) and see how I've compared the two. I can't explain any better than what I just explained in that last comment to be honest. It's just going to have to take time dude, don't force yourself to understand right away, because then understanding things won't be fun - when it should be.